Back in January, I made a Curious George birthday cake and was asked to make another recently for a little boy named Matthew. This George was slightly larger and filled with vanilla cake, coconut mousseline, and of course, caramelized bananas. It gave me an opportunity to try a new toy that I bought myself, a power sprayer, normally used for paint! Having used a power sprayer at pastry school and work for bon bons and entremets to achieve interesting finishes with chocolate spray, I wanted to give Curious George a velvety texture instead of glossy ganache glaze. Using melted chocolate thinned with cocoa butter allows a fine mist to be sprayed onto a frozen item, instantly solidifying into a suede-like matte finish. In fact, hardware stores can be a gold mine of useful pastry equipment. Cut metal piping become ring molds, four metal bars make an adjustable ganache frame, a graining tool can make chocolate look like wood, and the list goes on. My industrious German pastry school teacher taught me these important lessons. Not only are hardware stores more ubiquitous, but also the prices are usually far cheaper for the same tool that works equally well than when sold as a "pastry" tool. Can you tell that I'm frugal? 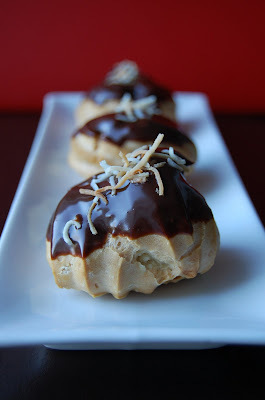 In case you haven't, I used the excess coconut mousseline as filling inside some profiteroles that were brought to a family dinner. Easy and delicious! Posted by Charmaine at 4:32 p.m.
First of all, it's not being cheap, it's being resourceful. I do that all the time and i think that comes from working in aprofessional kitchen where nothing was wasted, as it should be. So I work efficiently like that at home. Second, my son would love this cake! He is in love with Curious George... too cute! May 20, 2008 at 11:06 a.m.